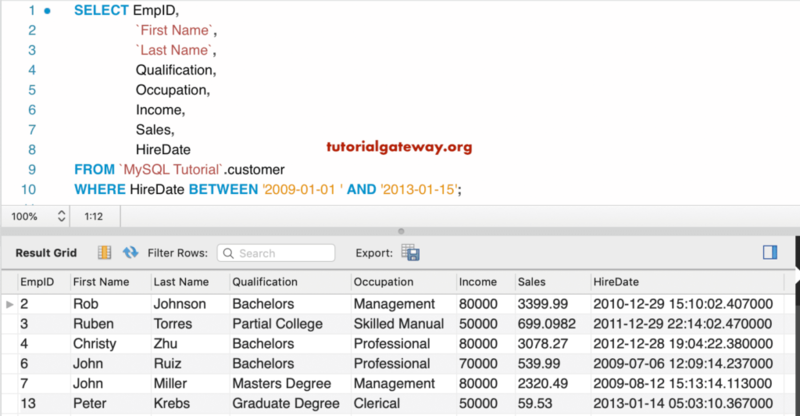 The MySQL Between Operator returns the records (or rows) whose values are between the given two values or range. 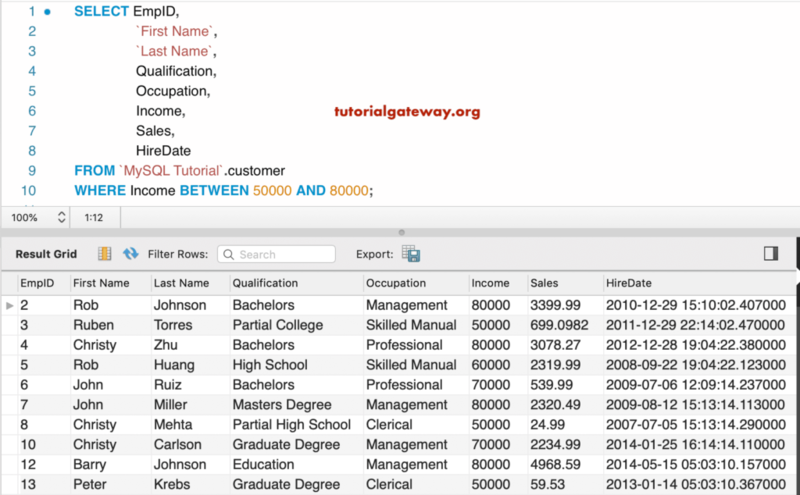 For example, to find the Sales between Jan 2018 to Dec 2018, you can use this MySQL Between Dates. 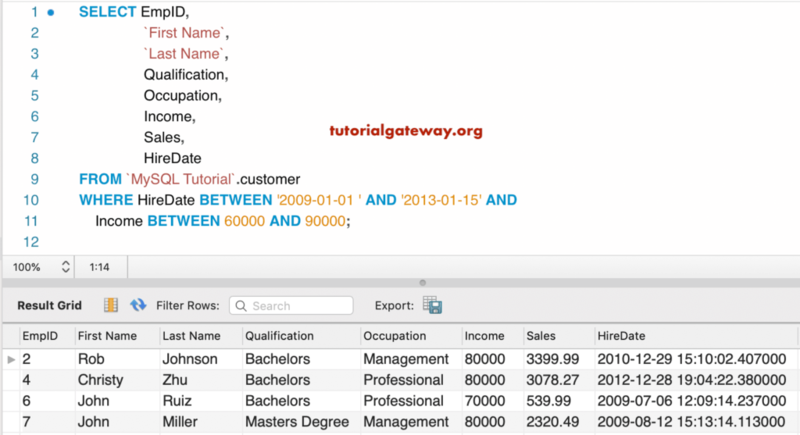 This operator displays the records available between the Value1 and Value2 Including them. It mean, Column_Value >= Value1 and Column_Value <= Value2. 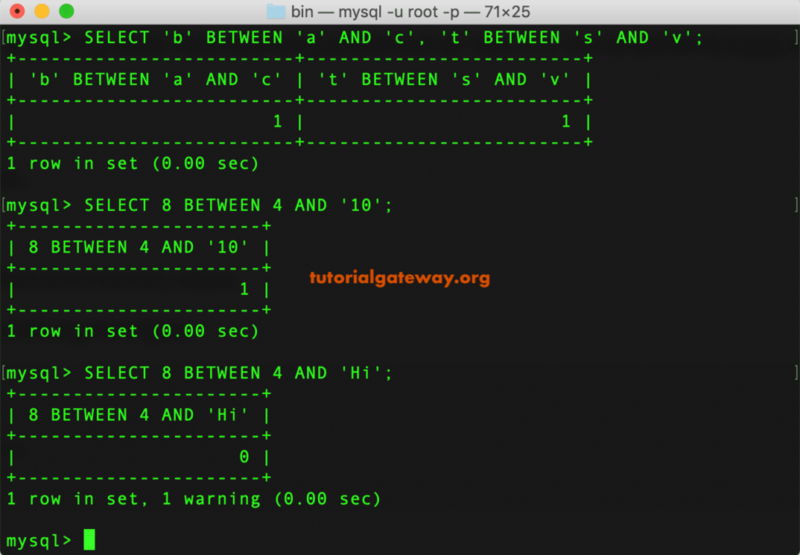 In this article we will show you, How to use the MySQL Between Operator with an examples. 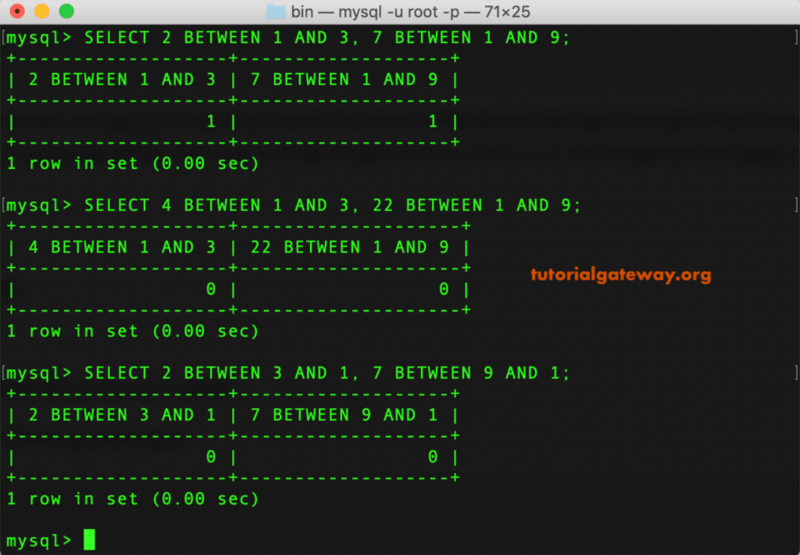 This simple example shows the working functionality of MySQL Between on Numerical values. In the first statement, 2 is between 1 and 3, and 7 is between 1 and 9. So, it returns 1. In the next statement, 4 is not between 1 and 3 and 22 is not between 1 and 9 so, they return 0. 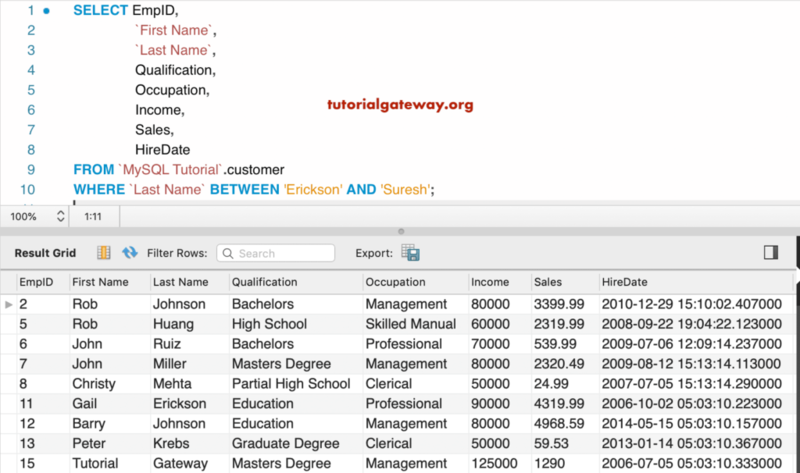 In this example, we will show you, How to use this Between operator on String data. The first statement returns 1, 1 because b is between a and c , and t is between s and v. Within the second testament, it will convert the string 10 to int and check whether 8 is between 4 and 10. The following query returns the Customers whose Income is between 50000 and 80000. Or, whose Income is greater than or equal to 50000 and less than or equal to 80000. TIP: We can also use single character instead of writing the complete name. Because, this function considers the first character as a reference. 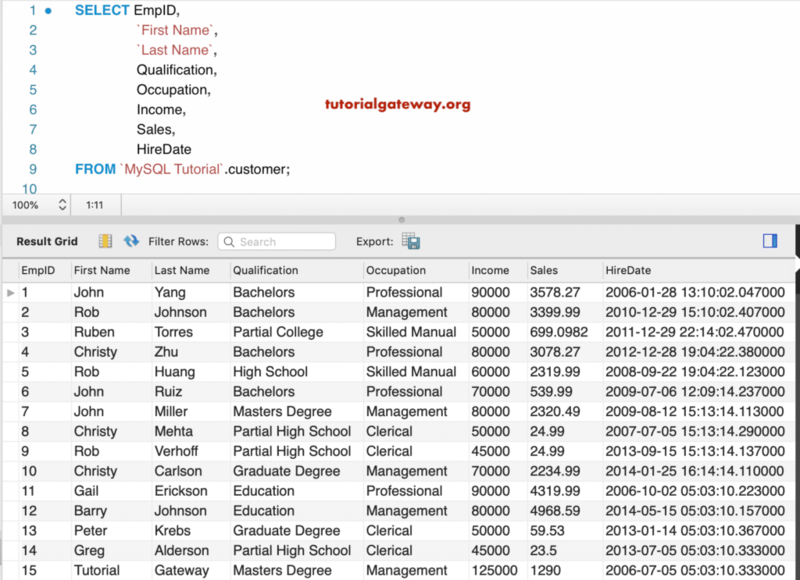 This MySQL Between Dates example find and returns all the Customers whose Hire Date is between 2009-01-01 and 2013-01-15 and Income between 60000 and 90000.